“TheOther40” Business Plan Competition offers SIUE students the opportunity to take a business idea through the stages needed to launch a product or service. Participants have access to business resources and develop entrepreneurial skills during the competition’s three-month process. “TheOther40” derives its name from data that shows approximately 60 percent of startups fail within the first five years of business. The goal of the program is to find, engage and support “the other 40” percent. Second place finisher Sydney Daniel, a mass communications major, was awarded $3,000 for Social Sweeper, an application designed to assist in the cleanup of business and personal social media profiles. Remaining “TheOther40” finalists included Jonah Durbin with Bar View 405, Berk Ozturk with Take N Eat, Alex Conley with Woodland Outfitters, and Courtney Weil with Declutter. 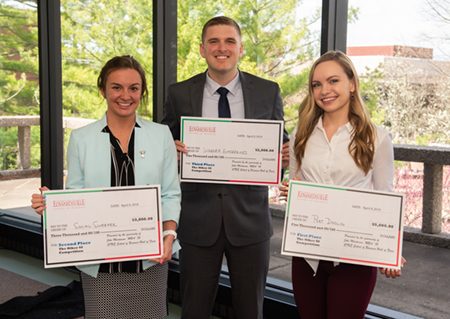 Photo: Winners of the SIUE School of Business’ 2019 “TheOther40” competition were (L-R) Sydney Daniel, Tristan Warner and Margaret Doolin.